I'm a huge fan of the idea presented above. It gets rid of the bus impact on the 610 frontage-Post Oak intersection, which is already functioning poorly during rush hour. Site as it is below (facing east). Pic by me. That's beautiful. I don't see how any of this is a negative impact on the area. Makes no sense. Looks like they are changing the location of the crosswalk. Look like it because the street will be widened a bit there. I believe it is a nice direction. Does anybody remember the movie "Logan's Run"? That is what uptown needs those pods that take your all over the district. And can be built over the streets. We are space city so do something! With all the highrises going up the traffic will just get worse. Trees down along Post Oak from roughly the Astoria north-east to 610. 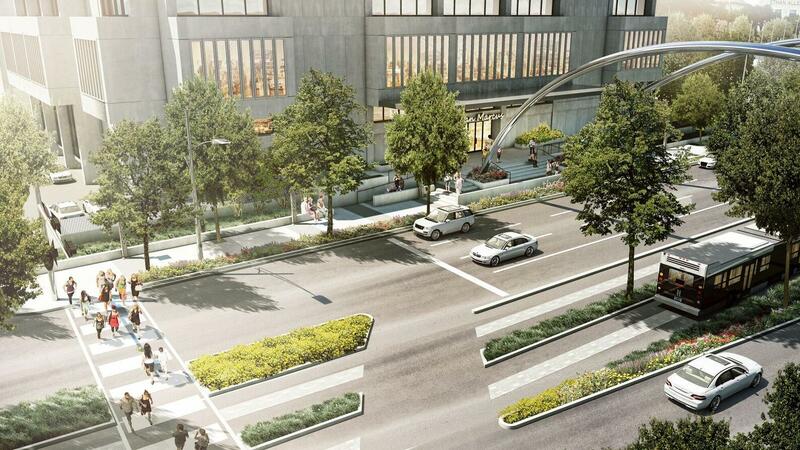 Apologies if I missed this somewhere earlier in the thread, but in lieu of future rail, could they install overhead wires and turn this into an electric bus lane? It would be far less intensive than building rail. They claim they can't, but they most certainly can and probably will. It will depend on ridership. At least this BRT is a start. Given the title of this thread, I want to explicitly state that I am FOR transit improvements along the Post Oak corridor, my home for 7 years. Asphalt laid from Uptown Park east. Utility improvements ongoing along the north / west side at various places. Tree removal in front of Astoria today (not visible). 2016 08 27: Pic by me. First pours occurred this week. Also (not pictured) the arches over Post Oak at Four Oaks Place have been lifted and new pieces welded to the bottom. The bottom is not yet attached to the ground. 2016 12 17: Pic by me. The parking lot here has a wall around the site with advertisement for a potential development. A website is listed but didn't catch it while passing by on I-610. Any have the scoop? I believe last time I drove by, it was a staging area for the bus line down Post Oak. I'm really looking forward to having decent sidewalks along Post Oak. Hopefully, Westheimer and San Felipe east of 610 will also be improved. its going to be a little hectic maybe during the process but wow i am blown away by this project and cannot wait for my neighborhood to be this beautiful...wow!!! Realty News Report: Will South Post Boulevard continue to have six lanes? Breeding: Yes. The Boulevard will be constructed in three phases and it is estimated to be completed in late 2018. Driveway access to properties along The Boulevard will be maintained at all times. Two lanes will be open in each direction in active construction segments and all traffic lanes will be open in non-active construction segments. We expect all six lanes will be completed by August 2018. Realty News Report: Dedicated bus lanes will run in express lanes down the middle of the boulevard. Can you describe these buses? How do the bus riders access the buses? Breeding: If we were a few years later, we’d be using Tesla buses! But in the first generation of operations, they’ll be articulated buses, painted to look similar to the light rail cars. The buses will have three door units – one front, one back and one in the middle. The bus will pull up to one of eight elevated platforms along The Boulevard and the doors will open. If you are using a wheel chair, you can roll from platform onto the bus or you can take your bike onto the bus, similar to light rail. 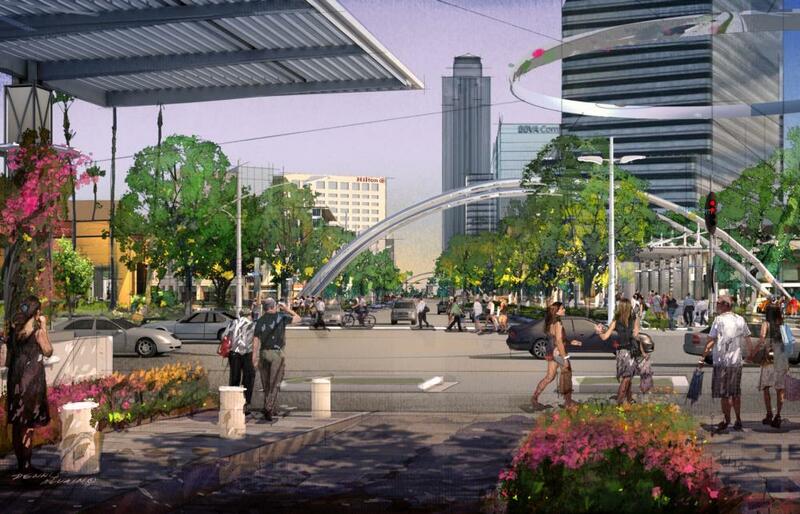 There will be eight well designed stations over the two miles of Post Oak Boulevard, or The Boulevard as we call it. Realty News Report: Does the plan offer improvements for pedestrians or cyclists? Breeding: The real thrilling part of all this is what we are doing for pedestrians. We will expand the four-foot sidewalks along The Boulevard to 12-foot-wide pedestrian environments and more than triple the amount of trees. In essence, Post Oak Boulevard has 350 live oaks. When we finish, it will have over 1,000 and be a colonnade of green. Realty News Report: Where are the terminus points of the express bus system? Breeding: The real terminus for the bus system is wherever Metro’s Park & Ride system is. The system will take you to, say, Katy or Sugar Land. A new Uptown Transit Center will be built to serve the Westpark Tollway and Southwest Freeway, allowing commuters and visitors to use the Park & Ride lots along these corridors. The busses will come into and exit through the transit center, and take the short jaunt to The Boulevard. We’re building from I-10 to 59, and two miles of the four miles is on Post Oak Boulevard. We’re just connecting into the system. Realty News Report: And the timetable for all of this? Breeding: We are moving very quickly. We have a very aggressive schedule and we ahead of schedule. We have 93 percent of the right of way purchased. We awarded the contract for the first third of construction in July of 2016. People will be driving on three of those lanes on the southbound side soon and driving along all lanes by November. And, two days ago, we awarded $60 million worth of contracts to build from San Felipe to Richmond. No we need a connecting link between Downtown and Uptown and we're in business! Does this project include the bus lanes that will be above 610? They are two related projects. Uptown is doing the lanes in Post Oak Blvd. TxDOT and Metro are doing the lanes from Post Oak Blvd to the Northwest Transit Center. Last I saw, construction of the 610 bus lanes was anticipated to start in late 2017. Didn't want to start a new thread for something so small but the Camden Post Oak tower along this development appears to be getting repainted. It is currently what I would call that yellowish Mediterranean look. It is going to the now typical off-white/grey. My only issue with this project is creating a signature boulevard that in several places fronts a giant parking lot, unless there are plans to redevelop the strip centers into BLVD Place style developments. 610 will now have two different remodel phases! Going to be a madhouse for the next decade. The Elevated 610 West Loop Express Lanes and then this 610 Bus Lanes. Post Oak Blvd. 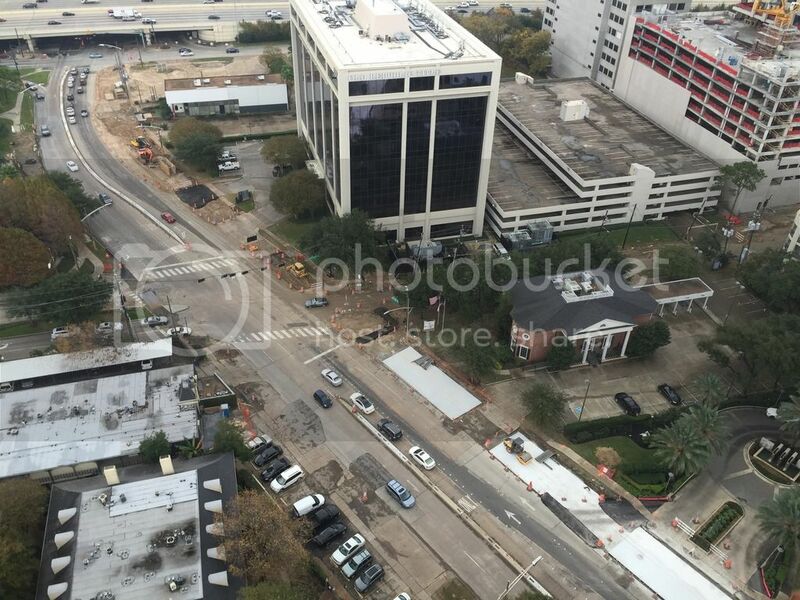 is being transformed into a major thoroughfare in the Uptown area to keep up with a rapidly changing district. The transformation is scheduled to be completed by the end of 2018, creating a pedestrian-oriented corridor in an effort to redevelop the entire length of Post Oak Boulevard from Richmond Avenue to I-610 West. The development includes a heavily-landscaped, grand boulevard lined with shops, restaurants and residential buildings. Sidewalks are being widened, extensive lighting installed and nearly 1,000 trees will create a green canopy over the street. In addition, the plan also calls for a dedicated bus lane in the median of Post Oak that will include eight unique bus stops along the length of the street, in hopes of making getting around Uptown easier. I'm pretty surprised this forum hasn't embraced this more. I'm really excited to have BRT in this city. Many of the great world cities use this service and San Francisco is building a couple of lines now. Chicago has the Central Loop BRT line that was finished recently. Knowing how much cheaper this is compared to rail, why not do the same down Richmond Ave or Washington Ave? Especially if it can easily be converted in the future. I think you're right J-c. An effective, more affordable and probably less politically volatile than Rail/Light Rail system could really be applied well to Houston to Houston's layout and needs. If Metro were to propose a Major BRT system, I would get behind it, and stop complaining about lack of rail (although I still think we'd need express rail lines to the airports). Completely agree. I think if anything, we should focus on rail to the airports and BRT for some of our major thoroughfares. It would be a quick shot in the arm for our public transit system. I think electric trolley buses would be a good fit for this project considering they're quieter and less polluting. Is it just me or is this arch new? They have always been there, they are just making them wider and therefore taller to accommodate the new widened roads! Love our arches and can't wait to get our UFO street signs back up! Target date for everything done is Dec 2018 but thinking it may go just a little beyond that... we shall see! The goofiest one... they turned the arches 90 degrees by the Dillards while they get lengthened. It's now north-south in the parking lot instead of east-west over the road. I *think* there might be one left, but another one of the unique Houston items...gone. ...to storage while the streets are torn up and poles moved. Looks like they will be returned to their glory. because the improvements aren't strictly going to be advantageous to promoting the single occupant car culture we so desperately cling to. The new sidewalks and trees being installed are really looking great and some of the more completed sections are getting more use. I walked to Uptown Park for lunch the other day and sidewalks are so much wider and makes me want to walk more if heading down Post Oak. Summer will be a different story, but I'm interested to see how this works when the trees provide a lot more shade. I think the lack of enthusiasm has to deal with the fact that putting in a dedicated bus line isn't going to transform Post Oak into some urban paradise. Frankly, I don't see the point of this project. Umm what? It links 2 major transit centers in the heart of Uptown. And yeah I think it will become an urban paradise over time. Solid infrastructure will help spur redevelopment of those shopping centers that line the boulevard. The point of this project is better transit OPTIONS and pedestrian access to the street. Would you have said the same if it was light rail because both projects are basically doing the same thing? It's still the Gold Line either way. All that's missing is a link between this and the Red Line and you have a solid system that will connect well with our street buses. The project is about making "the boulevard" walkable/pedestrian friendly/etc... What does linking two transit centers have anything to do with that? The fundamental problem is that Ashley furniture and empty parcels owned by Apache don't have any real appeal. Putting a bus and some trees on the street isn't going to change that fact. Is that an honest question? If you link 2 transit centers you allow for more flexibility to move as a pedestrian. Think about people living near either transit center wanting to get to Post Oak without a car. You can walk there but it defeats the purpose of making Post Oak more pedestrian friendly if you can't access it without a car. And are you that nearsighted to think that those developments are going to stay that way? I mean look at the bigger picture. 20 years down the road what you see now will change dramatically. And yes actually making the street more pedestrian friendly will change the entire aesthetic to the area, regardless of what's there now. Jesus. I almost fear that this is the way most Houstonians look at things because they fail to see the bigger picture. I mean if you need a sample size look at cities like NY for the best example of how transit helps businesses economically. If you rely on one source of transit and fail to give options then you literally cut the potential of that business. And besides that, THIS IS A MAJOR CITY. If you aren't building new options to move people, whether you think it's stupid or whatever, then you're behind. Because guess what? People are going to use it to get around. It's crazy because lot's of people said the same BS about the light rail and now you have developers using that as a tool draw people. Plain and simple, people need options. There's no fundamental problem with an Ashley's furniture that was built in an era that the car was the only option given to move people. Cities change and evolve for a reason and this isn't the Post Oak from 30 years ago. Is that an honest question? If you link 2 transit centers you allow for more flexibility to move as a pedestrian. 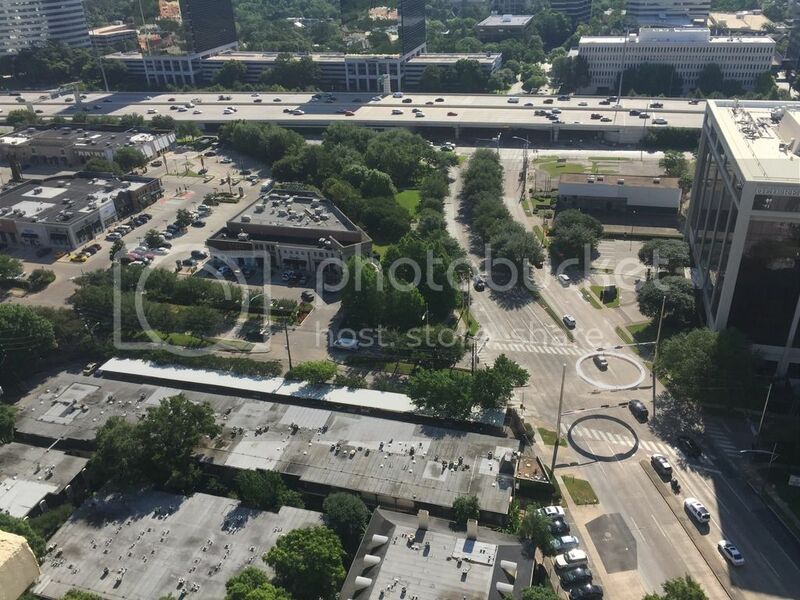 Think about people living near either transit center wanting to get to Post Oak without a car. You can walk there but it defeats the purpose of making Post Oak more pedestrian friendly if you can't access it without a car. We're talking past each other. In the abstract, yes, you are correct re: transit centers. That still has nothing to do with the fact that there's no incentive for someone to go to "the boulevard" in the first place, unless you consider Kenny & Ziggy's and Jamba Juice major draws. Some trees and a little more sidewalk won't change that fact. No Incentive??? What in the world are you looking at!?!? I worked at 2POC for 2+ years, so I've been looking at Post Oak Boulevard. What do you think is going to draw pedestrians out? The CPK or the quasi-abandoned AT&T store?